Giant, round entities have landed in the nation’s supermarkets, ready to probe your tastebuds and take your tongue to new galaxies of yumminess. Fortunately, this has nothing to do with any alien life forms taking over the UK’s sweetie aisles. This is simply a very welcomed invasion from Reese’s and their famous pieces. Tesco are currently selling Giant Reese’s peanut butter cups, in store and online. Now, usually when a brand describes a product as being ‘giant’, I take it with a pinch of salt. However, in this instance, the title is completely warranted. 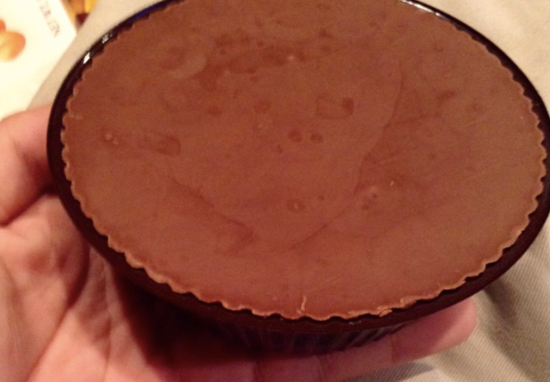 At 13 times the size of your regular peanut butter cup, this Christmas novelty product is a true Reese’s Beastie. Compared with your usual 17g cups, the difference is immense. Tesco sells two of these giant cups per £5 pack – rather than the regular treat trio – with each weighing in at a humungous 227g. Each cup contains 1,144 calories, which is pretty hefty when you consider a man needs to eat around 2,500kcal per day to maintain his weight. Probably best to share a packet with a deserving friend than to scoff them both yourself. Reese’s Peanut Butter cups are a classic candy collaboration; the perfect combination and chocolate and peanut butter. Nothing goes together better than Reese’s Peanut Butter and a creamy milk chocolate flavour coating. The original Reese’s Peanut Butter Cup was created in 1928 as a partnership between H.B. Reese and Milton Hershey. Since then, the Reese’s family has grown to include a variety of flavours and forms. Today, you can try Reese’s products in dark chocolate, white chocolate, snack-sized pieces and candy bars. I honestly do not know how I lived my life before Reese’s Big Cups were a thing. All I can think is that I was probably very, very sad not knowing the taste of what biting into the most perfect ratio of peanut buttery goodness to chocolaty delight was like. Before the Big Cups were traditional Reese’s, then came the teaser Halloween sizes and the Reese’s pieces, but honestly nothing even comes close in comparison to Reese’s Big Cups. The ratio is perfect, truly delicious in every single way. For those that already love the decadent taste of Reese’s, I introduce to you Reese’s big cup! The same creamy, sweet peanut butter paired with rich milk chocolate but on steroids! I never felt like one Reese’s did the product justice, but biting into a big cup is a different story. I prefer one Reese’s big cup over four regular sized ones. It completely satisfies. As well as these colossal cups, Tesco are also bringing in numerous Reese’s delights on the run up to the Christmas season. You can find Reese’s ‘Countdown to Christmas’ advent calendar at Tesco, also for a fiver. There are 24 treats behind each window, as is tradition. ‘Tis truly the season to give in to your Reese’s cravings.